Honest Tea is saying bye to Donald Trump. The beverage company said it would remove a Trump quote that was printed on some of its bottle caps because it had "run its course." The fuss started after a customer tweeted an image of the bottle cap with Trump's quote: "If you're going to think anyway, you might as well think big." Honest Tea, which is owned by Coca-Cola (KO), received backlash from Trump supporters after announcing on Twitter this week that it was "in the process" of removing the quote. 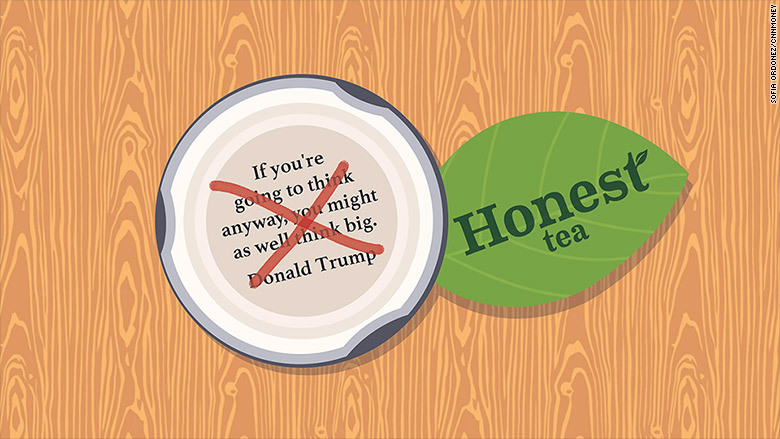 Trump's quote is part of an Honest Tea tradition that has existed since 1999. Over the years it has featured wise words from Winston Churchill, Helen Keller and Theodore Roosevelt, among many others. Honest Tea said it refreshes its quotes every 12 to 18 months. A new batch of 100 was already in the works before the Trump quote ended up on Twitter. "Mr. Trump's quote, which was not political in nature, was removed because it had run its course, along with other great quotes," co-founder Seth Goldman said in a letter to customers. "There is nothing objectionable to the thinking in Mr. Trump's quote," he added. "Indeed, it's certainly the mindset that we've brought to our business and our impact." Honest Tea is "a tea for all parties," Goldman wrote.